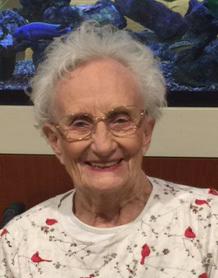 Joan Kerber Johnson, 88, went home to be with her Lord and Savior on April 3, 2018, at AngelsGrace Hospice in Oconomowoc. Joan was born on August 26, 1929, in Chicago. She grew up in Park Ridge and graduated with a teaching degree from Lawrence University in Appleton. She taught grade school for a few years before she married professional race car driver and Lincoln-Mercury car salesman Kenneth Johnson on August 8, 1955. Joan’s father, Edward Kerber, helped set-up Joan and Kenneth into a family newspaper business in Lemont, Illinois. Joan helped run the business before having four children. Joan’s hobbies included flower gardening and studying operas and then going to performances in Chicago. She loved everything to do with water including swimming, boating, and waterskiing. One of her favorite activities was going out for dinner with her husband and friends by boat on Lake Geneva. Her favorite indulgence was hot fudge sundaes. Joan’s Christian faith was important to her and was the driving force during the last 40 years of her life. She was active in her church including teaching Sunday school and in the later years of her life she traveled to many countries as a missionary. She was truly concerned for the welfare of others and was known as a prayer warrior. Those Joan leaves behind to cherish her memory include her four children, Cynthia (Ken) Comstock of Lake Mills, Randall (Kris) Johnson of Rockton, Illinois, Andrew (Laura) Johnson of Horicon, and Peter (Craig) Johnson of Chicago; ten grandchildren, Katie (Curt) Mould, Timothy Comstock, Ashley (Matt) Plummer, Branden (Megan) Johnson, Christopher (Kelly) Johnson, Quentin (Staci) Johnson, Tyler Johnson, Michael (Elizabeth) Johnson, Matthew Johnson, and Emily Johnson; seven great-grandchildren, Barrett and Jackson Mould, Mavrik, Avalynn, Temperance, and Lennex Plummer, and Arianna Johnson; two sisters, Nancy Zimmerman of Kenilworth, IL., and Judy Stevens of Glenview, IL. In addition to her parents Edward and Dorothy Kerber, she was preceded in death by two nephews and her grandson 1LT David Johnson. Visitation will be held on Monday, April 9, 2018 at 9:00 a.m. followed by a service at 10:00 a.m. in the chapel at AngelsGrace Hospice on Hwy. P in Oconomowoc. A Christian burial service will follow in Memorial Park Cemetery in Skokie, Illinois. The Myrhum Patten Miller and Kietzer Funeral Homes have been entrusted with Joan’s arrangements. Additional information and guest book may be found at www.myrhum-patten.com. Memorials can be directed toward the Gold Star Memorial Trail: Friends of Dodge County Parks, Inc., ℅ Gold Star Memorial Trail, P.O. Box 72, Juneau, WI. 53039.